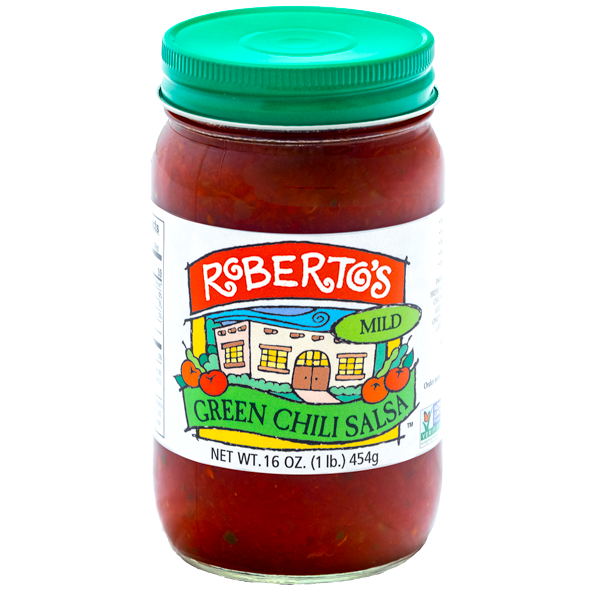 We wanted to share a few recipes from our biggest fans, made with our favorite Roberto’s Salsas. Directions: Preheat oven to 400 degrees. Spread rice in a shallow 3 – quart casserole. Top with chicken. 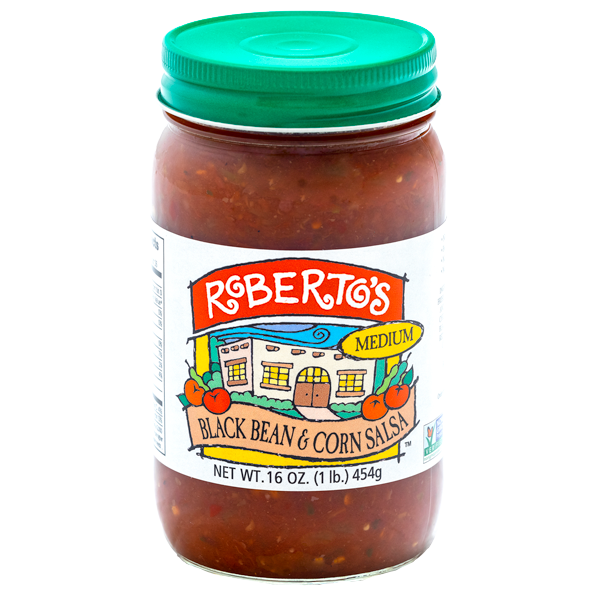 In a bowl, combine Roberto’s Black Bean & Corn Salsa, peppers, seasonings and garlic; pour over chicken. Top with cheese and optional jalapeño. Bake 45 minutes. Directions: Lightly sauté pepper, mushroom and onion strips with seasonings. Divide evenly on 5 tortillas. Add avocado slices, then sprinkle 3-4 oz. of shredded cheese over all. Top each with a second tortilla. Place in pan set at 350 degrees F. cover and check in approximately 2-3 minutes. When cheese is slightly melted, turn once and cover again for another 1-2 minutes. When cheese is melted, remove and cut into wedges. 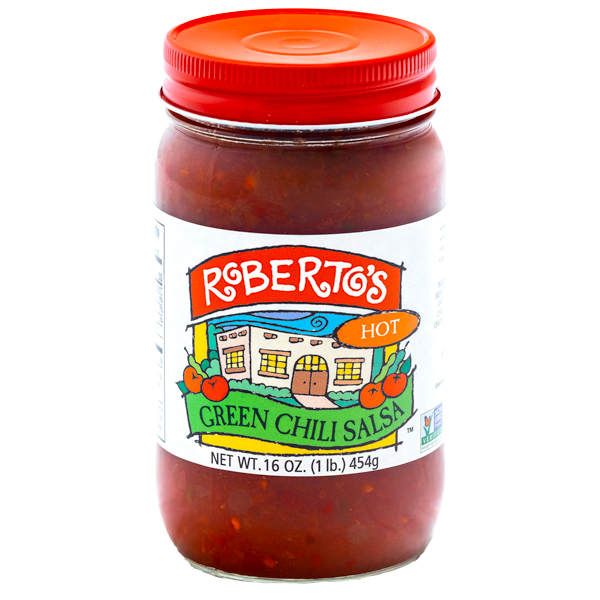 Top or put inside wedges Roberto’s Green Chili Salsa Hot. Directions: In a large shallow dish spread refried beans evenly. Peel and mash avocados with lemon juice and salt and pepper to taste, then spread on top of beans. Mix mayonnaise, sour cream, seasonings, and onions and spread over avocados. Drain chopped tomatoes and spread on top of sour cream mixture. Sprinkle shredded cheese evenly over all. Refrigerate at least 2 hours. (Can be made and chilled for up to 24 hours). 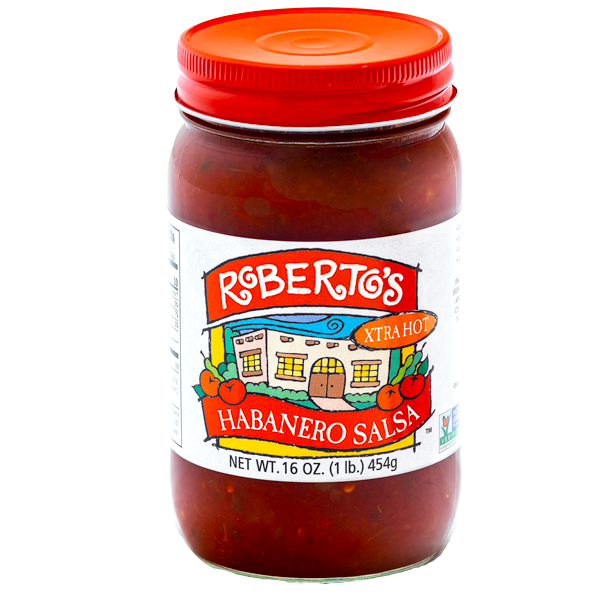 Remove from refrigerator for approximately 30 minutes before serving with chips and Roberto’s Habanero Extra Hot Salsa. Directions: In a large skillet, sauté pork in oil for 4 minutes add garlic; cook and stir 1 minute longer. 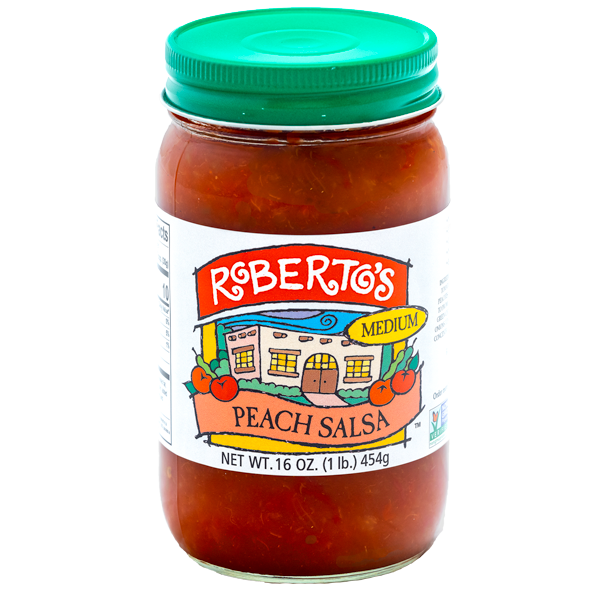 Stir in Roberto’s Peach Salsa; bring to a boil. Reduce heat; cover and simmer for 2 minutes or until meat is no longer pink. Serve over rice. Directions: Preheat oven to 350 degrees cook ground beef or warm meat alternatives and stir in seasonings. Divide and spread a thin layer of refried beans on 5 tortillas. Spread meat or meat alternatives on top of the beans. Add the tomato cubes and onions then sprinkle on 2 oz. of your favorite flavors of shredded cheese. Put a second tortilla on top and repeat layers as before. Place “stackers” in a non-stick pan and put into oven for approx. 20 minutes. Remove when cheese is melted. Serve with sour cream, avocado slices, Roberto’s Salsa, and a salad for an easy and tasty meal. 4 slices processed American cheese. 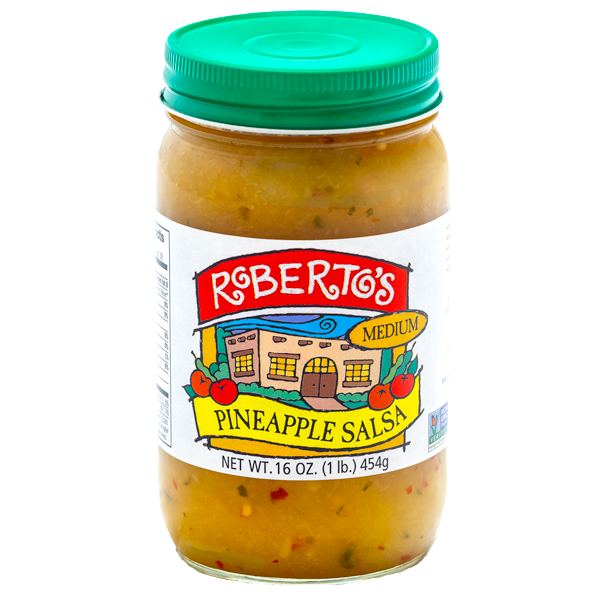 Directions: Combine tuna, mayonnaise, celery, salt, lemon-pepper, and Roberto’s Pineapple Salsa; spread over muffin halves. Top each with a slice of cheese. Broil 6 inches from the heat for 2 minutes or until cheese is melted and lightly browned. Serve immediately. Directions: Scramble or hard fry eggs. Divide evenly on 5 tortillas. Season with salt and pepper to taste then sprinkle with scallions. Add 3-4 oz. of shredded cheese to each tortilla. Sprinkle with bacon if desired. 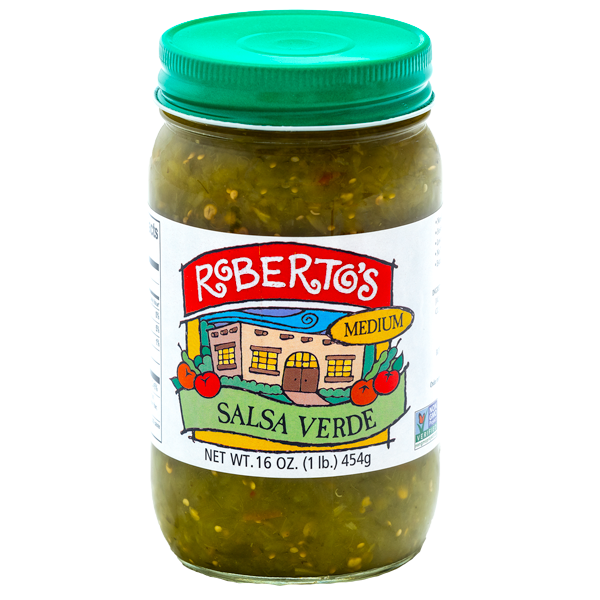 Spread your favorite Roberto’s Salsa Verde Medium over the shredded cheese and top each with a second tortilla. Place in nonstick pan at medium temperature for 2-3 minutes with cover on it. When cheese is melted, remove and cut into wedges. Directions: In a 6 quart sauce pan, combine first 7 ingredients. Over high heat bring to a boil; cover and reduce heat to low. Simmer 20 minutes stirring occasionally. Add beans, corn and chicken: increase heat to high until chili comes to a boil. Cover and reduce heat to low. Simmer for another 5 minutes. If upon standing the chili is too thick, add more chicken broth or water until desired consistency.